Single and triple accommodations are available for this tour; call us for rates. Extra nights in London are available for an additional charge. From the historical sights to the beautiful scenery to the special experiences, this Britain tour is a great way to sample what Britain has to offer! History buffs will delight in seeing mysterious, prehistoric Stonehenge; the Roman Baths in Bath, constructed around 70 A.D. and today one of the best-preserved Roman remains in the world; Chester, one of Britain’s best cities for archaeological and architectural treasures; Edinburgh, home to many Scottish monarchs, including Queen Margaret, who died here in 1093; and York, England’s most complete medieval city with its cobbled streets and the magnificent York Minister. Literary fans will enjoy visiting Shakespeare’s birthplace in Stratford-upon-Avon; Abbotsford House, home of Sir Walter Scott; Grasmere, home to William Wordsworth; and Cambridge, where you have the chance to explore the city and the colleges attended by many famous writers. Globus has also arranged special, out-of-the-ordinary experiences for you, like sampling Grasmere gingerbread, invented in 1856 in the English Lake District, and a cup of tea and shortbread in Abbotsford. After a hearty English breakfast, morning sightseeing with a Local Guide includes all the famous landmarks: the Houses of Parliament and Big Ben beside the Thames River; Westminster Abbey; Whitehall’s mounted horse guards and the Prime Minister’s Downing Street; Piccadilly Circus; and Buckingham Palace. Highlights are a visit to St. Paul’s Cathedral (except on Sundays) and the ceremonial pageantry of the Changing of the Guard, if held. Enjoy free time in the afternoon for independent activities or to join an optional excursion to Windsor Castle or the Tower of London with its fabulous Crown Jewels. This evening you may choose an optional dinner, followed by a cruise on the Thames River. Depart for a memorable day of sightseeing. First try to unravel the mystery of prehistoric Stonehenge. Explore the visitor center with its imaginative exhibits, then take the shuttle to the stone circle and admire the magnificence of the monument up close. Cross Salisbury Plain and head for the elegant Georgian city of Bath, where you will see the amazing excavations of the Roman Baths. You will also have time to explore the town further on your own. Tonight enjoy a Welcome Dinner with wine at your hotel. Savor vistas of the Cotswolds on your way via the medieval market town of Stow-on-the-Wold to Stratford-upon-Avon. Visit Shakespeare’s birthplace and take pictures of Anne Hathaway’s Cottage. The afternoon is dedicated to North Wales. Take a stroll in picturesque Llangollen, home of an annual international contest for poets and musicians. Spend the night at Chester, the historic county town on the Dee River. This morning’s walking tour includes the Roman remains, black and white half-timbered buildings, the cathedral and the two-tiered shopping arcades called the “Rows.” Next focus on the tranquil Lake District, considered to be the finest of England’s national parks. Take a break in Wordsworth’s beloved Grasmere, and try original Grasmere gingerbread. Next head north for the Scottish border. On the way through the history-steeped Lowland Hills, stop at Gretna Green, where the blacksmith used to wed runaway couples. In Edinburgh don’t miss the optional Scottish evening with Highland dancers, bagpipers and the Ceremony of the Haggis. Morning city sightseeing with a Local Guide introduces you to the 200-year-old New Town and the famous scientists, inventors and novelists who lived there. In the Old Town drive up the narrow Royal Mile to Edinburgh Castle to admire Scotland’s Crown Jewels, and then explore Holyrood Palace (when available). The afternoon is free for you to enjoy the Scottish capital at your own pace. Later you can choose a unique optional experience: Board the former Royal Yacht Britannia, once the perfect royal residence for glittering state visits and family holidays, and have dinner aboard the ship. First on today’s agenda is a guided tour of Sir Walter Scott’s Abbotsford House. After the tour enjoy a cup of tea and shortbread at Ochiltree’s Dining. Melrose Abbey and the ruins at Jedburgh are pointed out on the way to the English border and Northumberland National Park. In York, England’s most complete medieval city, stand in awe in front of the great structure of York Minster, then follow your Tour Director through its maze of quaint streets, including the narrow Shambles. Leave Yorkshire and its associations with James Herriot and drive through the richest farmland in Britain. Pause in the market town of Stamford before arriving in the beautiful university city of Cambridge. Return to London in the afternoon. Perhaps enjoy a night out on the town with your newfound friends. 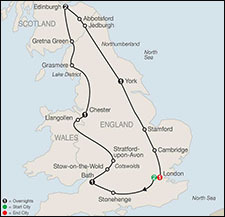 Call 800.459.1597 to Book Your Globus Tour of Britain Today! Prices based on availability, per person double occupancy and are subject to change without notice. Includes accommodations; 11 meals; on-tour motorcoach transportation; guided sightseeing; admission fees to attractions; hotel baggage handling; and all taxes and service charges. A $250 non-refundable, non-transferable, per person, per vacation deposit is required to reserve space for you, with some limited exceptions. Payment of the deposit indicates you have read and accepted these Terms & Conditions. Your booking is not confirmed until the deposit is processed by Globus and you receive a confirmation invoice. Final payment for your vacation is due 45 days prior to commencement of services, with some limited exceptions. Within the final payment date, payment in full is required at time of booking to reserve space. Reservations (land, cruise, and air) are canceled if final payment is not received by the due date; cancellation penalties apply, as noted below. See full Terms & Conditions. Price is per-person based on double occupancy, including accommodations; 11 meals; on-tour motorcoach transportation; guided sightseeing; admission fees to attractions; hotel baggage handling; and all taxes and service charges. Prices and availability are subject to change without notice. Fares shown are in U.S. dollars for new reservations only and are subject to availability. Please call us at 800.459.1597 for more information. This offer may not be combined with any other offer/promotion and may be withdrawn at any time. Airfare, airport transfers, car rental, optional tours and attraction tickets, and items of a personal nature are not included. Great Vacation Destinations, doing business as Bluegreen Travel Services, is located at 12400 S. International Drive, Orlando, FL 32821. Great Vacation Destinations is registered with the State of California as a Seller of travel Reg. No. 2068362-50 (registration as a seller of travel does not constitute approval by the State of California); Washington Seller of travel Reg. No. 602-283-711; and registered with the Airlines Reporting Corporation (“ARC”) number 15-72225-4. In the event of a conflict between Globus’ Details of Participation and Great Vacation Destination’s Details of Participation, Globus’ Details of Participation will govern.